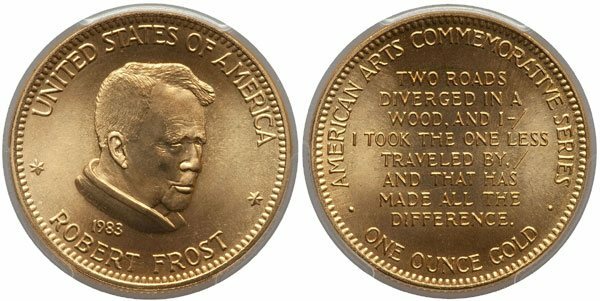 The American Arts Commemorative Series entered its fourth year with a one ounce gold medallion featuring poet Robert Frost. He is well known for his works containing realistic depictions of rural life and American colloquial speech. During his lifetime, he received four Pulitzer Prizes for Poetry and a Congressional Gold Medal. The obverse contains the inscriptions “United States of America”, “Robert Frost”, and the date “1983”. The reverse contains the additional inscriptions “American Arts Commemorative Series” and “One Ounce Gold”. The reported mintage for the Robert Frost American Arts Gold Medallion was 500,000 pieces, matching the series high for a one ounce medallion. From this amount 390,669 pieces were reported as sold, however, this figure does not reflect the true public demand. Rather this amount reflects the sales to the distributor for the program J. Aron & Company, who ultimately is estimated to have sold about 15% of their purchases to the public with the balance ultimately melted. Thus, the surviving population of the medals is considerably lower than the publicly reported mintage and sales figures suggest.